There's no place like home! And when you visit Kansas, Oak Park Mall will make you feel right at home. The mall is located at the intersection of 95th Street and Quivira Road. It is the largest shopping center in the metro area, with over 170 stores and restaurants for patrons to frequent. Book lovers will enjoy a stop by the B. Dalton Booksellers location, and kids at heart will have a hard time resisting a side trip to the Disney Store. The Discovery Channel Store will have shoppers wide-eyed at all the fun and games. When you're ready for a break, have a seat and let the kids play in the soft play area or ride the kiddie train. You could also share a ride on the carousel with your child. Been shopping all day (mall hours are 10:00am to 9:00pm Monday through Saturday and Sunday from 11:00am to 6:00pm) and worked up an appetite? Step into the jungle at the Rainforest Caf� and enjoy the atmosphere as much as the food. Or try Ruby Tuesday, for their famous all-you-can-eat salad bar. Looking for something on the go so you can keep up the fast-paced shopping extravaganza? Swing by the food court and get counter service at Panda Express, Quizno's Subs, or Sonic. When you're finished shopping, stay and relax with a movie at the AMC Theatres. You're sure to find a movie you can enjoy with popcorn, a soda, and a snack. 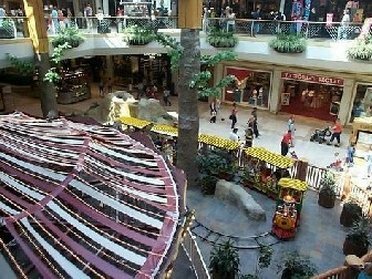 Oak Park Mall also offers complimentary stroller and wheelchair services (on a first come, first serve basis), as well as conveniently located post office drop boxes (with the last mail pickup on weekdays at 4:40pm). Obviously, Oak Park Mall aims to please and should not be discounted as a location to visit.